Broadcast Solutions is one of the largest system integrators in Europe. Founded more than 15 years ago in Germany, the company stands for innovation and engineering services "Made in Germany". With subsidiaries in Europe, Asia and the Middle East, Broadcast Solutions plans and implements projects around the globe. Services and products cover all areas of wireless communication for the transmission of video, audio and other data. By combining products and solutions with proprietary system integration, Broadcast Solutions offers innovative overall concepts. 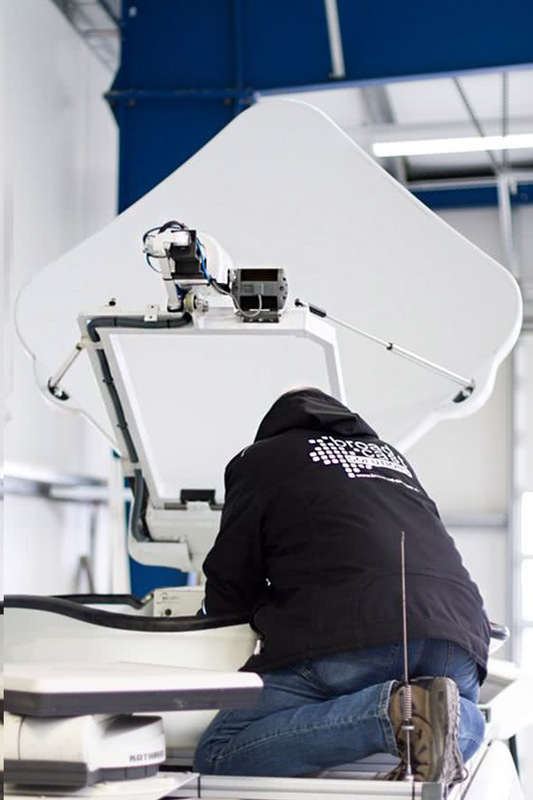 With more than 140 employees, Broadcast Solutions operates as a manufacturer-independent system integrator and provides customers with tailor-made solutions – from the initial idea to implementation and beyond. The goal is a long-term partnership with customers. An essential part of Broadcast Solutions’ success is the close connection with customers, consultation before and during the project phase, as well as the service and support after successful implementation. With many years of experience and more than 400 completed projects, Broadcast Solutions has the necessary know-how to provide IP-based system solutions for communication in critical situations. We can install and integrate the technology and tools in a wide variety of environments. For more than 15 years, Broadcast Solutions has been planning and constructing OB Vans, studios, and vehicles for satellite communication, live TV production, equipping TV channels, setting up TV studios and providing the complete equipment from the camera to the satellite channel. We use our expertise in the area of communication for authorities to develop innovative solutions and products in the field of Public Safety. Broadcast Solutions provides new and innovative products and system solutions to authorities and organisations with security tasks, which offer decisive advantages in tactical and strategic use, both stationary and mobile. Broadcast Solutions develops and manufactures mobile command centres and emergency vehicles and equips them with broadcast, communication and media technology. Vehicles for covert or open surveillance or investigation are designed in close cooperation with customers. As a reliable system supplier, Broadcast Solutions has worked closely with the police, disaster control, first responders and various military units for many years. In hazardous situations in particular, it is clear that the key to success lies in the rapid development of infrastructures and the exchange of information. Interoperability and high operational readiness of the systems are vital. Broadcast Solutions offers mobile Ad Hoc Networks (MANet) and wireless radio links for data transmission and mobile operations centres or surveillance centres – we are specialists in modern communication and innovative mobile concepts for networked operations. Broadcast Solutions is one of the largest system integrators in Europe. Founded more than 15 years ago in Germany, we stand for innovation and engineering services "Made in Germany". offer you sales, project planning, production and services. everything from a single source: coachbuilding, interior design, electrics, air conditioning, audio-, video-, network-systems as well as wireless- and Satcom-systems. we develop complete solutions and technologies for complex applications in any environment. worldwide. We offer innovation and technology "Made in Germany" for international projects.